You only need to take a look at alcohol memes on social media to see that is is a common understanding that alcohol can be a solution to stress, a way to reward yourself for a job well done, and a vital part of Mum’s self-care routine. Anyone who has, or is, dealing with alcohol addiction will tell you the other side of this. Alcohol is neither solution to problems, nor is drinking it an act of self-care. It is, in actual fact, the exact opposite of this. When I was drinking, the height of self-care to me was a long bubble bath with wine, music, a joint and a book. I could lose hours in the bath, refilling at least twice, and getting out wrinkly and very, VERY blurry. I probably didn’t take in much of the book by the end! For a little while in sobriety, baths felt odd and became far more functional as I had to learn to enjoy them differently. Now, I am back to enjoying long soaks in the bath with music, a book and a herbal tea! Developing a good self-care routine really does make sobriety easier. Here are just some of the benefits I have found. Recovery is not just about giving up the addictive behaviour, it is about developing a new set of coping strategies to help you navigate the difficult times in life. Having a good bank of self-care strategies gives you plenty to turn to when you need to deal with stress. A bank of self care strategies, and regular use of them, means that when you are stressed or unhappy, you will know what you can turn to in order to make you feel better, and to process the way you are feeling without needing to resort to numbing through drink, drugs or other self-harming habits. Addiction often has its roots in, and fuels, low self esteem. That feeling of inadequacy, the inner voice telling you constantly that you are not good enough, can be drowned out if you drink/smoke/shop/surf/gamble enough. For a while at least, but it always returns. Making self-care part of your daily routine starts to tell that inner voice that actually, you are good enough, and that you deserve to be treated well. A self-care routine will help you to get yourself into a relaxed state of mind, and enable life to flow easier around you. A nighttime routine that nourishes you before bed will help you to be ready for sleep, and to help you get a better night’s sleep. Helpful nighttime self-care ideas could include a warm bath, reading some light fiction, journaling, writing a gratitude list, drinking herbal tea, some light exercise such as yoga and self-massage. When you take care of yourself and feel valued by yourself, you are better able to communicate your needs to others. Often, when we feel inadequate or undeserving of love, we lash out at the people around us, frustrated by our inability to say what we really want and need. Much of the time we don’t even realise that this is happening. By learning how to respect and value yourself, you become better able to show others what you need. My mother used to tell my brother and me, when she was in need of some alone time, ‘I am going in the bath and I don’t want to be disturbed’. When she told us this we knew that we had better have a real ‘life or death’ reason to disturb her, so we didn’t. This meant that my mum was able to restore herself and enable her to deal with raising two quarrelsome children! It creates disassociation from the body and can lead to a lack of concern for your personal care. The addiction can take priority over physical needs, and we learn to ignore the messages that the body gives. I couldn’t even begin to count the number of times I ignored my tiredness, or my aching liver, in order to carry on drinking. Prioritising self-care means that you learn to respect what your body and mind need, and give it to them, so if you need rest, you rest, if you need water, you hydrate etc. All of the points listed above are vital benefits that we get that help us to stay solid and safe in recovery. I know that when I am not taking good enough care of myself, I start to feel really out of balance, and can start to feel quite overwhelmed, muddled, drained and lost. It is in those times that my mental health is most at risk, and I need to exercise extreme self-care to bring myself back to balance. Recently I have felt quite unsettled and unbalanced and reflected that my self-care was dwindling. Among many things, I realised that my coffee consumption had risen a lot, and I needed to return to the calmer, less anxious state that a caffeine-free life. The agonising headache and stupefying exhaustion that the detox created confirmed to me that coffee really isn’t good for me, and that I need to eliminate it from my life. Already, now that the headache and exhaustion have mostly passed, I am feeling clearer, happier, more at peace and definitely more focused! Learn 5 breathing techniques that will help you relax, sleep better, manage and stress, and take control of your emotions...and more! Esther is a former alcoholic, smoker and all round stressed out mess. She found the path to health, happiness, freedom and joy through Yoga. She is a passionate advocate for the power of Yoga, and time in Nature, in bringing balance to life, and giving you control over your health, happiness and wellbeing. Esther is a powerful public speaker, writer and author. 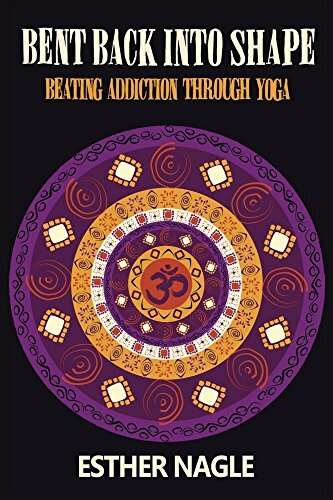 Her first book, Bent Back into Shape, Beating Addiction Through Yoga, has gained many 5 star reviews and has helped many people along their recovery journey.